If you plan to get involved in robotics, you will need to familiarize yourself with the many types of motors available. All robotic movement is motorized in one way or another, so it is important to know what your options are. Larger motors are best suited for mobility bases that allow robots to maneuver the terrain. Some of these motors come with gearboxes to produce the slower speed and torque needed for mobility. Lowering the voltage to a motor can also slow it down to a more desirable speed. Only experimentation can determine if your motor will operate with a lower voltage. If it does, you’ve saved yourself a lot of trouble, if not, there are other ways of slowing down motors. Some high-speed motors can be used if worm gears or screw gears are used. 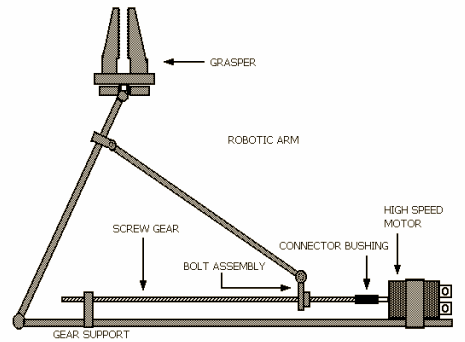 An example of the screw gear can be seen in the robotic arm illustration. When the motor turns clockwise the bolt assembly is pulled to the motor and the arm contracts and when it turns counter clockwise, the arm extends. Although the motor shaft is turning fast, the arm action is considerably slower because of the screw reduction. 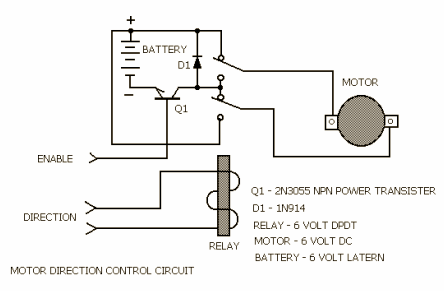 In this following motor circuit illustration, we see a DC motor controlled by a power transistor. A relay switch (Double Pole Double Throw), determines the direction. Transistor Q1 should be a power transistor to take the heavy load of a motor. Some motors derive a speed reduction by operating from a pulsed DC signal. This signal is usually about one hundred Hz. The speed of the motor can be altered by changing the pulse width, not by changing the frequency of the pulse. 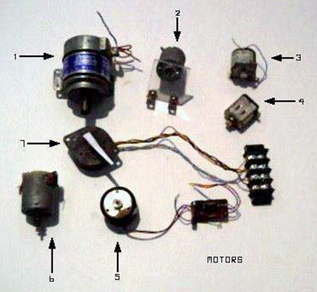 Motors like these can be found in surplus electronics shops and can easily be identified by the pulse generator connected to it. 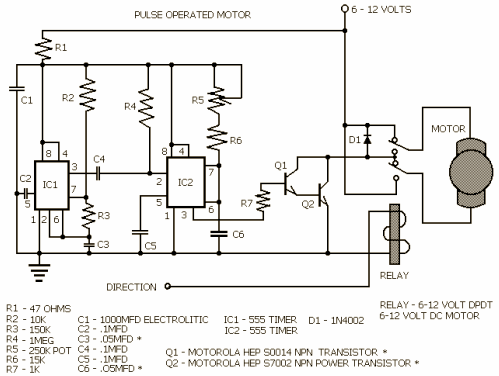 Any DC motor can be driven by a pulse source though, and a schematic of such a circuit is included. As you can see a 555 timer was chosen as the drive oscillator, which produces a frequency of approximately 100 Hz. Resistor R1, and capacitor C, stabilize and isolate the pulse generator from the spikes produced by the motor. Since this device can draw from a power supply of 6 to 12 volts, you might want to change the value of capacitor C4 and C6 for better results, depending on what voltage you use. The pulse output is taken from pin three of IC1 and fed to pin two of IC2, also a 555 timer. The second timer varies the width of the pulse by adjusting the voltage that is fed to capacitor C6 through potentiometer R5 and resistor R6. The duration of the pulse is what determines the speed of the motor and the pulse width can be adjusted from 10% to 100%. Transistor Q1 receives the pulse width modulated signal through resistor R7. Since Q1 is a low current device, it passes the signal to Q2, a power transistor that can handle the current demands of the motor. These transistors are not critical and almost any type of low-current power transistor will work. The relay will determine what direction the motor will take. The most complex of all motors is the stepper motor. Like the name infers, the motor turns in degree increments and is pulse operated. The exact degree of turn per step can vary from one manufacturer or model to another, but 20 degrees is popular and produces 18 steps for one complete turn. 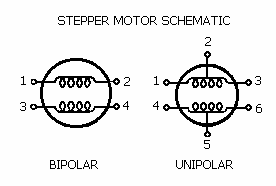 There are two basic types of stepper motors, bipolar and unipolar. 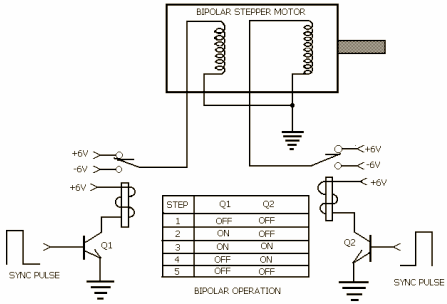 As you can see in the stepper motor schematic, the bipolar is simply a two coil operated motor. The unipolar type is two coils with center taps. If the center taps are ignored, the unipolar motor can operate as a bipolar type. The two coils in a stepper motor are fed step pulses alternately in polarity from coil to coil. A map of this process is provided in the working diagram to graphically represent the motor action. Unlike conventional DC motors, torque decreases with speed. A special type of drive unit is also required to advance the stepper motor and should be supplied with the motor. It is not recommended that you build a control unit unless the motor is supplied with a good spec sheet that has component recommendations and full schematic. Some robotic functions require only a partial turn, such as head or arm movements. The easiest way to achieve these is with position stops and slip gears. An illustration of the mechanical details of this type of motor is provided above. Micro-switches can be used as stop sensors to turn the power off and reset the direction for the next action. The bottom wheel is connected to the motor while the top wheel is separated from the bottom wheel by a circular piece of felt. When the bottom wheel turns the top wheel turns with it until the stop pin comes in contact with the micro-switch. Some designs do not make provisions for stopping the motor, so simple screws with spacers will function as motor stops. 'Hall effect' is named for its discoverer, American physicist Edwin Hall. When a conductor or semiconductor is subjected to a magnetic field, it produces a Hall voltage. The magnetic field distorts the flow of electrons, enabling designers to use the hall voltage to drive motors without generating sparks. The use of Hall effect motors will enable robots to operate in hazardous situations (where explosive substances or gas is airborne), without trigger explosions. 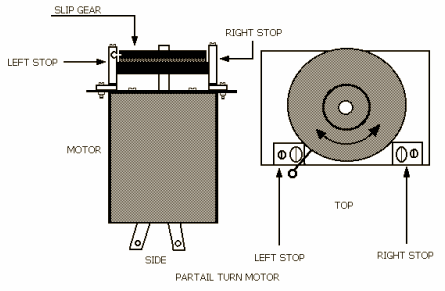 Another type of motor that does not produce a spark is an optical drive motor. A slotted disc on the rotor shaft is set between two LEDs and two phototransistors, alternately passing or interrupting an infrared beam. This creates switching signals that feed drive coils, which attract or repel a fixed magnet on the drive shaft. This optical drive technology is in its developmental infancy currently and may become more commercially available in the future. 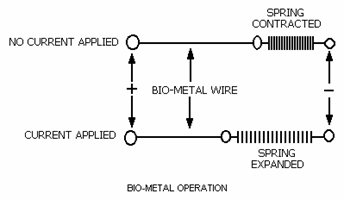 Bio-metal is an amazing substance that has been around for a few years and it has a number of applications in the field of robotics. We can see in the illustration, that a piece of bio-metal wire will shrink by five percent of its length when just a few volts are applied across it. After years of testing, bio-wire has proven to be strong, reliable, and is becoming more useful as new products emerge. Its somewhat slower response time makes it ideal for robotic arm and hand applications, where jerkiness would be problematic. A long piece of wire can produce a significant movement when stretched the entire length of a robotic arm. There are robotic arm kits currently on the commercial market that use the bio metal. The relay, in robotics, is almost always used to isolate the power meant for motors, from the power supply for computer function. Motors, because of their low impedance, make heavy current demands on power supplies and create multiple glitches that computers can not tolerate. It is therefore a good idea to use a separate high current source for just motors. Solenoids are best used as manipulator control devices or switch operators. Their movement is quick and strong so a spring is almost always used in graspers to soften the action. As you can see in the illustration, control wires are used to close the grasper. These control wires can also act as return springs. Graspers such as this are found more in production line work where the task is very measured and covers narrow parameters. Most motor functions involve mobility, arm, head, or some other visible external movement, however, some motor movements are not so visible. Large industrial robots use hydraulic systems that use pump motors to produce operating pressure of a hydraulic fluid. Another important secondary function of motors is control adjustment. To improve accuracy, potentiometers that are interfaced with motors are usually multi-turn devices.